After World War II had ended William Mandel pointed to the fact that much lower temperatures were experienced in the winter campaigns around Leningrad during the Soviet-Finnish fighting 1939/40, around Moscow and Leningrad in 1941-42, and around Stalingrad in 1942-3. The implication was much wider and more serious than Mandel’s statement suggests. However, the Russian-Finnish war 1939/40 lasted from December 1939 until March 1940 over a full first war winter. On 30November1939, the Soviet Red Army invaded Finland. The first month turned out to be a nightmare for the Red Army. They were taken by surprise by extreme weather conditions occurring totally unexpected in the high north of Europe. Some of the weather conditions reported from the front lines (see below: e.g. Chronicle, December 24) were totally unusual for the time of the year and deviated so much from the average that it was hard to believe that such a condition could have happened without any reason. Like the excessive rainfall in Central Europe from September to November 1939, precipitation in the Arctic Circle might have been caused by earlier military activities as well. Actually, the first month of fighting, in a region roughly 500 kilometres north and south of the Polar Circle, took place in almost permanent night conditions. Finland, separated from the Atlantic by the Scandinavian mountain ridge, and situated between the Barents Sea and the Baltic Sea is a climatologically sensitive region during the final weeks of the year. Drier air above Finland or colder water of the adjacent seas, would make the weather more continental. If military activities in Finland forced increased precipitation, the less humid air could flow further east into Russia. If the Russian continent west of the Ural lacks moisture, the area will support the development of high pressure and the flow of cold air to West Europe. When naval and coastal defence activities forced a quick release of stored summer heat out of the Northern Baltic Sea, the influence of low-pressure conditions diminished. Once that happens, the Baltic Sea area is an easy target to icy air from the Arctic or Siberia. In the North Sea and the Baltic Sea the extraordinary war winter of 1939/40 originated. (A), with its centre in the coastal zones of Germany (Hamburg). While the foundation for this winter had been laid long before December, as explained in other papers. (B), the war in Finland should certainly not be ignored for the overall outcome of meteorological conditions during the first war winter. For this reason a fairly comprehensive picture of the main military activities and weather situations observed in and around this Nordic Country shall be taken into account. Further details: (A) Cooling North- and Baltic Sea, 2_16, 2_17; (B) Lost west wind drift, 2_12. In the first place, this assessment will demonstrate the quick succession of unusual weather events, which show that the common atmospheric processes over Europe at this time of the year was influenced by something uncommon, resulting in an aggressive, extreme and erratic reaction. This was particularly intensive in the high north and at Europe’s Mediterranean coast. The latter region with its extraordinary weather events around New Year’s Day 1939/40 will be covered in a separate paper. · The invasion of Finland had started - and ‘blinding snowstorms’ waged along the 750 miles of the battle line on December 4/5. · The Russians started a major offensive on about December 20th/21st - and blizzards occurred and the temperature fell to below -30°C. · Joseph Stalin had amassed 300,000 of his best troops to attack Finland from the north and the east (NYT, 27 December), sometimes shelling Finnish positions up to 48 hours continuously - and snowstorms and unusual low temperatures reached the battle fields (December 29th/30th). · Russia deployed 2,000 large guns (NYT, 18 January), which spat one hundred shells every minute (NYT, 01 February) - but ‘a pitiless deathly cold laid a glacial cover on Russia’s war machinery tonight with phenomenal 54 degrees-below-zero temperatures’. (NYT, 18 January). This is hardly a matter of mere coincidence. The following chronicle, which covers the time from 30th November 1939, to the end of February 1940, makes one wonder whether all these vagaries of weather were caused by the course of nature. Although the extremely harsh winter of 1939/40 clearly originated further south in the North and Baltic Sea, the fighting around the Arctic Circle also might have contributed to it in one way or other. In comparison (see Chronicle, below), temperatures were measured in Finland, e.g. on 24th December 1939 (-34°C); 30th December (-40°C); 2nd January 1940 (-40°C); 17th January (-48°C). In 1936, Finland was already warned by Russia that it could adopt a “forward strategy” and occupy the country if it would intervene in a war between Russia and Germany. The German-Soviet non-aggression pact and secret protocols of 24August 1939, assured the Russians that they could pursue their interests in Eastern Europe from Finland to Poland. Stalin lost no time to increase Russian influence and presence along these lines. When Stalin did not get the concession he was looking for from a Finnish delegation a war plan was prepared in late October, assuming that a military offensive would last no longer than 15 days. The Germans persuaded Finland not to give in and diplomacy ended, when the last Finnish delegation returned from Moscow on 13th November 1939. Stalin ordered the mobilisation of the Red Army along the entire Soviet-Finnish boarder, while the Red Naval Commissariat prepared for operations in the Gulf of Finland and the Baltic Sea. More than a dozen submarines patrolled the coastal waters, and the first sea mines were laid. 22September, 1939: “It is also reported here that Russia has mined a part of the White Sea (Barents Sea) as if expecting attacks in Arctic waters”. (NYT, 22 September 1939). 10October 1939: “Finland’s fleet was mobilizing tonight at the port of Abo in readiness to transport troops and war material to the near-by Aland Islands if they are threatened by Russia.” (NYT, 11 October 1939). 20November, 1939: Due to the early onset of winter and sub-zero (Celsius) temperatures on 20th November only one of three battleships from the Baltic Fleet was able to reach the Lake Ladoga via the Stalin Canal to Schusselburg. The weather charts of the ‘Deutsche Seewarte’ indicate snowfall since 18th/19th November, but not any serious minus zero temperatures. 30November, 1939: In the Barents Sea from the North Cape to the city of Murmansk naval activities were increased. 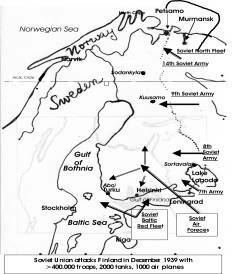 The Northern Fleet was ordered to provide artillery support to the Red Army. On November 30th the Russians had four armies with 450,000 men stationed along the 1,000 kilometre-long front, 2,000 tanks and 1,000 aircrafts, all-in-all about one quarter of the total strength of the Red Army at that time. When the Red Army began systematic shelling and bombing of Finland at 06-50 hours on the morning of 30th November, the Soviet-Finnish winter war had started. In Stockholm, about 400 km south of Harnoesand , December temperatures remained fairly close to the average, except during the days December 24 - 28, with 5° to 11° degrees below average temperatures. The temperatures in Sweden in December 1939 do not necessarily indicate that in the fairly close neighbourhood conditions have been very different, as illustrated in the chronicle below. Actually, the mean temperature for Sweden in December 1939 was -2.5° C. This is a deviation of only -1.2° C from the average means of -1.3° C, based on 30 years (1901-30) of temperature recordings. Concerning the war and weather situation in Finland this investigation relies primarily on information provided by daily newspapers. It seems clear that some exaggerations may have occurred. During wartimes war parties regard propaganda, misinformation and even plump lies as legitimate. Even weather reports are not excluded. The following information indicate some extraordinary weather conditions prevailing in many military operations. Some reports indicate extreme deviations from previous December conditions. The investigation presents them without comment and verification. Insofar the reader is advised to use other sources as well for obtaining a complete picture on Finland’s weather conditions in December 1939. Of particular help in this respect could be a Finnish website: www.warwinter.com, concerning the Russian-Finnish War, indicating that the December weather 1939 was widely within common range, if not even mild, until the fourth week. Only since 20th December temperatures dropped sharply and remained extreme low until the end of the year. The average temperatures in December 1939 were: Helsinki (-4,4°C), Sortavala (-8°C), Kajaani (-8,5°C), and Sodankyla (-18°C). The situation at Finland’s northern outlet to the Barents Sea, Petsamo, is not particularly mentioned on www.warwinter.com. The Gulf of Bothnia has the deepest sea bottom in the Baltic Sea. In hydrodynamic terms this semi enclosed bay stores considerable heat at a very sensitive climatic site thus far up north. Any activities in these waters during the winter season are particularly crucial. There had certainly been a lot of transportation of minerals from Sweden and Finland to Germany going on until the ports had been closed by ice. Presumably Sweden and Finland also took a lot of preventive measures along their coastlines, e.g. patrolling, mining and naval exercises. But the Gulf of Bothnia did not become a serious naval battlefield. Nevertheless, the few known activities, some of which are listed in the following, might also have contributed to the development of the temperature, snow and ice-conditions in the far North. It is a well known fact in navigation, that one can delay the icing of a water way by moving a ship through the water that pushes the icy-surface water down to replace it with warmer water. This will work only for a short period and the averted icing will return more severely. The assumption that such techniques had been used too keep Haparanda (see previous section) and other ports at times of war open as long as possible, is not too far-fetched. 3– 20 December 1939: At least five Russian submarines operated in the Gulf of Bothnia sinking the Bolheim, a German steamer of 3,324 tons off Rauma, on 10 December, 1939. 15 December, 1939: Swedish navy was laying mines in Aaland’s South Kvarken Straits, in an attempt to prevent submarine activity in the Gulf of Bothnia. 25 December 1939 to 19January 1940: Two more submarines enter the Gulf of Bothnia, a third boat is lost on a Finnish mine barrage in the passage to the Gulf. The others sink the Wilpas (775 tons) off Vasa on 28th December, the Fenris (484 tons) on 5th January about fifty miles south of Umeaa; while one submarine attacks a convoy in Aaland waters on 13th January. 5 January 1940: Russian submarine shelled the Fenris of 484 tons, in the northern part of the Gulf of Bothnia today. The attack revealed that Russian submarines have penetrated deep into the gulf, by passing through heavily mined waters of the Aaland Islands. (NYT, 6 January 1940). 13 January 1940: Gulf of Bothnia. A mine sweeper and two patrol boats dropped depth bombs, in an attempt to cripple a Russian submarine which had trailed the small Finnish steamer Bore 1 through the international waters of the Gulf of Bothnia. (NYT, 14 January 1940). The Russian-Finnish naval activities in the Gulf of Finland are included in the following chronicle. 30. November 1939: The Finnish army’s strength along the entire 750-miles north-to-south front is said to be 250,000 regular troops and 100,000 men of the volunteer corps. (NYT, 4 December 1939). About the southern Karelian front it was said that a force of about 40,000 Finnish troops is pitted against 70,000 or 80,000 Red Army troops. (NYT, ditto). “All in all, the Leningrad Military District command (Red Army) enjoyed a material superiority over the Finnish army by 3:1 in manpower, 80:1 in tanks, 5:1 in artillery of all types and 5.5:1 in aircraft”. 30. November 1939: “Military observers believe the Russian forces in the Leningrad district and the Lake Ladoga region to total at least 5,000,000 men. The number of available tanks is given as 1,000 and the number of fighting planes as 500.” (NYT, 7 December 1939). 30.November 1939: Gulf of Finland „The (Russian) commanders of transport ships and torpedo boats were so afraid of being attacked by Finnish submarines, that they set off depth charges every 15 minutes, or whenever an unconfirmed sighting of a periscope was made, resulting in a total of 400 depth charges being dropped by the end of the operation that day”. Bombed from the air the cities and towns of Helsinki, Kotka, Kemjaervi, Kittikai, Petsamo, Utti, Kaiplais and Viborg. Seized the four undefended Finnish islands ….after heavy aerial and naval bombardments. Seized Finland’s vital ice-free port of Petsamo on the Arctic Sea only three miles from the Norwegian frontier, after heavy serial bombings and artillery battle with Finnish troops. Sent warships westward through the Gulf of Finland, perhaps for bombardments against Helsinki from the sea. Occupied several centres in the Finnish territory…. Bombed from the air and attempted to seize the peninsula of Hangoe, seventy-five miles west of Helsinki….. Bombed the 3,900-ton Finnish warship Ilmarinen…..” (NYT, 1 December 1939). 30. November - 1December 1939: The Baltic Fleet cruiser Kirov and two destroyers shell the Finnish island of Russaro, which returns the shelling. 30. November 1939: (Bergen, Norway) Two British destroyers and a damaged submarine (T-53, 1,300 tons) put into port of Fosteroey, north of Bergen, today, reportedly after a battle with German planes at sea. 30. November 1939: On the first day of invasion, Baltic Fleet bombers spotted the two Finnish battleships anchored off the island of Russaro. Within two hours the Baltic Fleet command sent eight long-range bombers. As the ships had meanwhile disappeared, the squadron dropped their 600 bombs on Helsinki; two additional squadrons were sent out to destroy naval air fields around Helsinki; they managed to destroy 12 airplanes and several hangars while losing two bombers of their own by Finnish anti-aircraft fire. 1. December 1939: “Bombs dropped on Helsinki, civilians were hastily leaving in the mist and rain in the northern winter”. (NYT, ‘The Week in Review’, 3rd December, 1939). 2. December, 1939: “Snow began falling on Helsinki, where relief workers sought to extinguish fires and to clear away rubbles before Russian bombers returned again with a rain of death”. (NYT, ‘The Week in Review’, 3 December 1939). 8-9. December 1939: The Finnish coastal batteries on Koivisto carry out gun duel with Baltic Fleet shelling forces, consisting of the battleship Minsk, two destroyers and three gunboats4. 10. December 1939: “Violent fighting in knee-deep snow on Finland’s eastern frontiers at the Arctic Circle was reported today”. (NYT, 11 December 1939). “Hostilities in the northern sector were said to be proceeding in weather 4 degrees below zero (-20° C)”. (NYT, ditto). “In addition to the Red Army troops killed in battle, many others were reported to be dying of cold and exposure after being isolated from their supply trains and bases in the snow-piled wastes”. (NYT, ditto). 17. December 1939: “Last week’s fighting took place on days, that saw the thermometer in Central Finland go no lower than 4 degrees below zero (-20° C), while in Karelia temperatures ranged from 5-14 degrees above (-15 to -10° C). (NYT, The Week in Review, 17 December 1939). 18. December 1939; The German weather service observed that cyclone activities in the high North have become strongly active again, at the same time the extreme cold had been continuing in that area. At Spitsbergen, in a strong northerly air current -15° C has been measured, providing the European arctic sector with a very cold air mass. 18. December 1939: A squadron of the Soviet Baltic Fleet (one battle ship Oktjabrskaja Revolutsija, five destroyers and further support vessels) shelled the 254mm Finnish coastal battery at Saarenpaa on Koivisto, with the arrival of a further battle ship, Marat, on the 19th. Also planes bombed the island. „The Finnish coastal batteries have been in lively combat for the last few days. Time and again they have been attacked by Russian planes or bombed. The coastal batteries around Koivisto have been especially exposed to bombardments”. (NYT, 20 December 1939). 20. December 1939: A highly spectacular weather event took place in the longest night north of the Polar Circle off the Roest (Lofoten), near the Norwegian port of Narvik. On the 20th December a cyclone developed suddenly, pushing air pressure down by 54.6 mb in 24 hours. 20. December 1939: “Russian drive was stalled in the far north by blizzards and temperatures 25 degrees below zero F (-31° C)”. (NYT, 21 December 1939). 20. 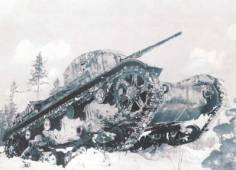 December 1939: “Fierce fighting surged across the Karelish Isthmus in sub-zero temperatures (below -17.8° C) today, as Russians lost hundreds of tanks in a savage drive, they deployed 200 Red Air Force planes in widespread bombing attacks on the rest of Finland. The roar of artillery could be heard from one side of the 65-mile-wide Isthmus to the other”. (NYT, 21 December 1939). 20. December 1939: “Russians retreat from Finland, in Arctic cold and snow”. “By mid-afternoon the Finns were reportedly fighting in heavy snowstorm and subzero cold”. (NYT, 22 December 1939). 21. December 1939: At the Arctic front the Russians retreat in less than minus 30° C. (Neue Zürcher Zeitung, NZZ, 22 Dec. 193939). North Finland temperatures down to -30 ° /-36° C. (Hamburger Anzeiger, 22 Dec. 1939). 23. December 1939: Heavy snowstorm reported from Latvia. (Hamburger Anzeiger, 27 December 1939). 23. December 1939: During the third week of war Russians launched several major offensives against the Mannerheim-Line positions. 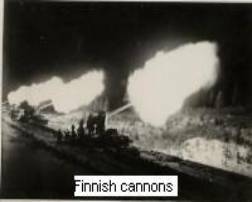 They employed a huge number of flaks of medium and large calibre up to 20-cm and showered a countless number of shells continuously on Finnish positions, lasting for 48 hours. They further attacked Finns with 200 tanks and several hundred airplanes, followed by a large number of infantry. (NZZ, 24 December 1939). 24. December 1939: Report by James Aldridge (extract from NYT, 25 December 1939): “The cold numbs the brain in this Arctic hell, snow sweeps over the darkened wastes, the winds howl and the temperature is 30 degrees below zero (minus 34.4 ° C). Here the Russians and Finns are battling in blinding snowstorms for possession of ice-covered forests. …I reached the spot just after the battle ended. It was the most horrible sight I had ever seen. As if the men had been suddenly turned to wax, there were two or three thousand Russians and a few Finns, all frozen in fighting attitudes. Some were locked together, their bayonets within each other’s bodies; some were frozen in half-standing positions; some were crouching with their arms crooked, holding the hand grenades they were throwing; some were lying with their rifles shouldered, their legs apart…. (T)heir fear was registered on the frozen faces. Their bodies were like statues of men throwing all their muscles and strength into some work, but their faces recorded something between bewilderment and horror.” (NYT, 25 December 1939). 25. December1939: Extract from a journalist’s report: “Today was even colder than yesterday, the mercury hovering around 15(F) below zero at midday (Viborg region)… (w)e saw six Soviet bombers plunging over the edge of the city, leaving trails with smoke, the result of their exhausts freezing in the intense cold. Some minutes later more groups appeared from all directions until thirty planes were wheeling over the city and its environs. …(t)he bombs ranged in size from 30 to 200 pounds..(T)here were bomb craters up to thirty feet in diameter and fifteen feet deep…. (T)hese explosions were as freakish as tornadoes”. (NYT, 26 December 1939). 26. December 1939: Finland carried the war to Soviet soil yesterday with a drive across the border seventy-five miles from Russia’s vital railway to Murmansk, Helsinki reported. But Russia claimed a victory in the Suomussalmi region, continued the bombardment of Viborg and bombed many other southern towns. (NYT, 26 December 1939). 27. December 1939: Joseph Stalin has amassed 300,000 of his best soldiers on the eastern and northern fronts… (T)he Finns estimate that the Red Army has lost 4,000 men in fighting in the extreme north alone in the last three days…(T)he Finns said they had identified sixteen Russian divisions confronting them (each about 18,000 men). (NYT, 27 December 1939). 27. 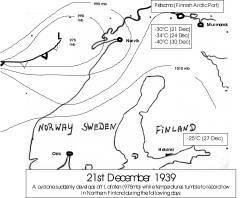 December 1939: Viborg: The weather last night and today aided the Finns. Low clouds prevented Soviet air observation and a resumption of intense bombing activities of the last few bright days. Lower temperatures are prompting snow, which the Finns are hoping for. Finnish artillery is blasting huge holes in the ice of frozen lakes… (T)he Russians, forced for three weeks to conduct their campaign along canalised lines because of the chain of interlocking lakes, today took advantage of several days of 10 to 15 degrees below zero weather (-23/26° C) and directed a massive attack against the Finnish left wing across the ice. (NYT, 29 December 1939). 28. December 1939: “For two days the writer (James Aldridge) has been at the front with an advance post of the Finnish Arctic Army. From a hut somewhere between Kemijaervi and Salla, I have been watching the Finns conducting a remarkable war successfully against overwhelming Russian forces in Winter cold, 30 degrees below zero, and amid blinding storm. …(in) the bitterest weather conditions of any war ever fought”. (NYT, 29 December 1939). 29. December 1939: At the Petsamo Front heavy snowstorms are continuing. (NZZ, 29 December 1939). 30. December 1939: According to reports from Kirkeness in North Norway mighty snowstorms blew over North Finland. Horrible cold prevailed in the Finnish north front area. Temperatures have fallen to 40° C below zero, a cold of such magnitude is seldom seen in this area in December. Due to this weather experts consider it impossible that larger military actions can be waged. (Hamburger Anzeiger, 30/31 December 1939). Only a few significant weather data are mentioned. The Gulf of Finland was completely frozen since mid January. 2. January 1940: Soviets lost 12,000 men in battle on lake. Finnish patrols on ski are hunting down the bewildered remnants of the 163rd Red Army Division, which was surrounded and shattered last Friday and Saturday. A blizzard is raging. The main battle took place on the ice of Lake Kianta in a temperature of 40 degrees below zero (-40° C). (NYT, 3 January 1940). 4. January 1940: NYT Commentary comments on the reports of James Aldridge (see above: 24December 1939, and 2January 1940): “If reports are true, someone in Moscow blundered. The Russians were not ready for such cold weather”. (NYT, 4 January 1940). 5. January 1940: A Politiken’s newspaper correspondent tells of the strangest evacuation she had ever seen – not women and children, but animals, in 40 degrees below zero Fahrenheit. There are more than 200,000 reindeer in Northern Finland. (NYT, 6 January 1940). 7. January 1940: Report by K.J. Eskelund from Karelian Isthmus (extract): A wave of arctic weather stopped all Russian attacks on the Karelian Isthmus today. 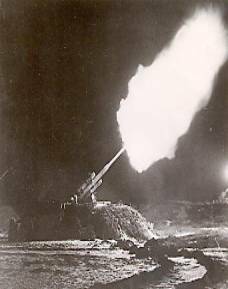 However, the Soviet artillery began a strong bombardment late in the afternoon. …(I)n spite of several layers of wool and fur coat I myself nearly froze this afternoon when, with the temperatures 25 degree below zero (-32° C), I accompanied a group of foreign journalists on a visit to a Finnish company several kilometres behind the front lines. (NYT, 8 January 1940). The weather has proven an unexpected ally to the Finns, who usually look for the coldest temperatures not until February and March. In Helsinki in Southern Finland it was 15 below (-26° C). Ice forming in the Gulf of Finland has severely crippled the Red Fleet. (NYT, 8 January 1940). 8. January 1940: A record frost today covered Northern and Central Russia, with the thermometer at 31 degrees below zero Fahrenheit (-35° C), and impeded normal activity. (NYT, 9 January 1940). 10. January 1940: Russia now has 400,000 men and more than 2,000 large guns on the Karelian Isthmus, a high Finnish office declared today. (NYT, 11 January 1940). 13. January 1940: Riga/Latvia; The bitterest cold wave of years, which sent temperatures in the Baltic countries to as low as 40 degrees below zero Fahrenheit, ended abruptly today. The mercury rose rapidly to a few degrees below zero Fahrenheit. Parts of the Baltic Sea have frozen over, and floating and pack ice are likely to interfere with shipping for some time. (NYT, 14 January 1940). 18. January 1940; Helsinki: “Pitiless, deathly cold laid a glacial cover on Russian’s war machinery tonight… near Salla, above the Arctic Circle. Phenomenal 54-degrees-below-zero temperature (-48°C) restrained the Russian air forces, …and apparently immobilised Russian ground forces, which have been attacking on the Karelian Isthmus. (NYT, 18 January 1940). 18. January 1940: Temperatures of more than 50 degrees below zero Fahrenheit were reported from several points. At Nickby, northeast of Helsinki, a temperature of 58 degrees below zero was recorded – the coldest since 1878. It was 11 degrees below zero in Helsinki. (NYT, 19 January 1940). 20. January 1940; “Thus they are able…to relieve men exhausted by a week of fighting in temperatures plunging to 60 degrees below zero”. (NYT, 21 January 1940, p.23, left 1st column). 21. January 1940: “The cold polar air remained stagnant over vast areas of Europe and North America. Result: Some of the coldest weather in half a century. In Moscow the temperature on 17th January dropped to 49 degrees below zero Fahrenheit (-45° C), and in parts of Finland to 58 degrees below zero. Such temperatures can be measured only on alcohol thermometers, because mercury freezes solid at 38 degrees below zero.” (NYT, 21 January 1940, Weekend in Review, Title: War in the Cold). 27. January 1940: Helsinki. “Victims in the coldest Winter in sixty years…” (NYT, 27 January 1940). Koivisto lost, Finns admit. (NYT, 27 February 1940). On 12th March 1940, a treatise is agreed upon to end all hostilities.